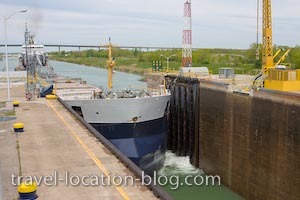 Picture of a large freight ship entering Lock 3 of the Welland Canals system in St Catharines, Ontario, Canada. Canals, St Catharines Museum, Ontario. We lucked out with a lot of ship traffic at Lock 3 of the Welland Canals system located at the St Catharines Museum. Although when we first arrived a small leisure boat was exiting the lock, coming up the canal from Lake Ontario was a large freight ship. These incredible feats of engineering, the locks system, can be seen at many locations throughout Ontario - but one of the best places to view how a large container ship is lifted is at the St Catharines Welland Canals Centre. These huge metal beasts are lifted a total of nearly 100 metres from Lake Ontario to Port Colborne on Lake Erie, by entering a series of 8 locks along the Welland Canal system. The canal and locks allow ships to scale the Niagara Escarpment and avoid the 51 metre high Niagara Falls. Large bulk carrier ship entering Lock 3 of the Welland Canals System at the St Catharines Museum, Welland Canals Centre, Great Lakes-St Lawrence Seaway, St Catharines, Ontario, Canada.